This weekend will be filled with tacky T-shirts, fried food, cheap mixed drinks and beach ultimate. That's right, it's time for Wildwood! Happy dance! Although I hope walking by the shark every day on the Discovery building won't make me too nervous to venture into the ocean. They really shouldn't have shark week right before I'm headed to the beach. I also hope our garden doesn't get away from us while we're gone. The tomatoes and cucumbers are in abundance and the green beans just flowered again. The squashes are still in the flowering stage, as are the eggplants. We have a lot of cayenne peppers growing and the bell peppers are all flowering. Our lettuce hasn't survived the heat, even in the shade tent, but the radishes are looking very healthy. I want to try a late crop of spinach in the shady area next. I just got back from the annual Fool's Fest Ultimate Frisbee Tournament, which was tons of fun but now I'm beat. At some point, I'll post pictures of that, but for now I'll get some pictures up of Loki. She was a hit at the tournament, but that's no surprise. Who can resist an adorable puppy? She held up well to a three day tournament and lots of new people, so that's a good sign. She'll be seeing a lot more frisbee sidelines. The weekend was fun, tiring, and less rainy than expected. I didn't venture out to the parties but enjoyed the company of my team. Games were delayed on Friday and canceled due to rain on Sunday due to new park management that doesn't want us tearing up the fields. Which is understandable, especially at the beginning of the field use season. However, the first weekend in April nearly always rains, making our team wonder what the future of the tournament will be if we can't play in the rain. Perhaps they will have to find new fields for next year. At any rate, it was a fun time this year and Chris had a great time too. Sadly, I managed to leave my phone behind in Fredericksburg or perhaps it accidentally went home with someone else. I'm hoping to hear about its whereabouts soon, otherwise I'm in the market for a new phone. It was good to get back out on the frisbee field for a full tournament and has really given me motivation to get back in shape. For pictures from the weekend, visit here. Wildwood, New Jersey: tackier than a post-it note and greasier than a can of crisco. One weekend a year, over 2,000 ultimate players flood the town and hit the beach for the largest ultimate tournament in the world. The last Friday night in July, teams crowd into run-down, overpriced motels and prepare for a weekend of 4 on 4 ultimate, swimming in the ocean, and the obligatory fried food for breakfast, lunch, and dinner. After diving for a throw that's just a little too far away for the speed you can run on the beach, you can't get the sand off of you for the rest of the weekend. Going down to the water can help get some of it off as well as adding salt to the mix. And somehow, after a long day of playing, you actually manage to be allowed into a restaurant covered in sand, and afterward trudge over to the beer tent. The evening goes on from there and often ends in go cart races. This past weekend was no exception. All the thunderstorms missed us except the last game of the last day, so the weather was mostly gorgeous. Every year I forget how difficult it is to run on sand for even the relatively short games that we play. Every year I come ready to party and end up crashing from exhaustion much earlier than intended. And every year I have an absolute blast. It's great just running into other ultimate players you haven't seen in forever. I'm currently so very sore from playing all weekend, but it's worth it. Since the fields are small and the teams don't have to be as big, we split our regular team up into 2 for the tourney. We were both in the non-competitive division and as luck would have it, we ended up playing each other in the finals for our pool. We didn't get to finish the finals, as we were kicked off the beach due to lightning, but we called it a tie and brought the trophy home to DC. I think the battery powered blender (An awesome wedding present; thanks, Rod!) and sideline margaritas significantly improved our play throughout the weekend. Unfortunately, I don't have any pictures. Some year, we'll get a disposable camera, but the sand, salt, and water would not be good for our regular camera. Oh, and I don't mean to gross anyone out by the title of the post. We were discussing words that people hated to hear. Moist and crusty were both near the top of the list. However, at the end of the day, covered in sand and salt water, we realized that's just what we were. After a very long drive home through much traffic, we finally got back, showered, and collapsed. And so another Wildwood weekend comes to a close. It appears that I am currently the second result in Google for Drew Ultimate. The first result is some Script-o-rama page that has nothing to do with anything. Strangely, the official Drew frisbee page is nowhere to be seen. I wonder what happened to it. Oh, and speaking of Frisbee, our camera is quite fun for ultimate pictures. They're no longer the specks off in the distance that look a little bit like they're in a stack. Now we can take good action shots. Check out this one of Dave from our FiFi team. Remember last month or the month before when I mentioned that HitTail suggested I write about sweet ultimate frisbee pics? Hmm, probably not...I doubt my blog is read that closely. Anyway, I think I will pursue this topic as a good use of my blog. Well, maybe it's a topic that is better displayed than written about. Unfortunately, I haven't been able to upload said pictures for some reason. I think the files may be too big. But rest assured, I will work on it and put up some of my frisbee action shots. And especially considering the new camera, I hope we will taking lots more and I'll have plenty of opportunity to post. In the meantime, there are some frisbee shots on this board of Plaid and Drew Ultimate. And some shots of Your Mom. Hehe, what a great name. You think the joke will grow old and it never does. Anyway, I guess I'm just writing to let you know that the great action shots of ultimate frisbee games are on their way. The alumni game for my college ultimate team is next weekend. I actually have another tournament to go to, so I will not be attending. Actually, even if I didn't have a tournament, I don't think I'd go. But that's neither here nor there. The point is that in lieu of attending the game and dance, I want to do something fun and Drew Ultimate related besides waiting around for Fool's Fest. Therefore, I am going to be inviting alumni to be guest columnists and collecting the history of Drew University Ultimate Frisbee. It's a team with a rich history and a whole lot of spirit and it's time that our story was told and shared. So interspersed with my other random posts, I'll be compiling stories and pieces of that past over the coming months. Eventually, I hope to work with the alumni to create a website for all of it. It should be an exciting project. Stay tuned. "Watch the Tram Car, Please"
The last weekend in July is the best weekend of the entire year. Each summer, I look longingly to those dates on the calendar, which have been marked long in advance, and I count the days. Then finally that weekend comes around, and leaves again all too quickly. It is always an awesome time and this year was no exception. Wildwood is boardwalk, silt-y sand, tacky t-shirts, run-down motels, creaky rides that are scary because of the actual danger you're in, carnival games with aggressive hawkers, and a great opportunity for people watching that isn't quite like anywhere else in the world. Only in Jersey. My greatest boardwalk food finds of the weekend: cheese fry pizza and fried twinkies. Add to this 169 ultimate teams with the most creative names and homemade team shirts, all chomping at the bit to lay out on the beach once more. It's a giant Frisbee reunion, with people you've played with or against for years, met at past ultimate parties, or are friends of friends that you're just meeting for the first time. There were so many people I was glad I got to see. My sophomore roommate I hadn't seen since graduation. My old college, Drew Ultimate team I hadn't seen in almost a year. Some people I hadn't seen since last Wildwood and others I hadn't seen since the last tournament we were both at. My fiancé I hadn't seen in four days and my club team I hadn't seen since last Wednesday's practice. I missed them all and was sooo happy to have the opportunity to enjoy their company once more. And throw the disc with them. And go on rides with them. And hit a diner with them. And meet them at the beer tent. We got out to the beach Saturday morning and the fields were a disaster. Friday night's rain didn't quite leave puddles behind, it left lakes. Our field had no high ground. Not a bit of sand was showing and there was at least 3 inches of water. Warm weather and sandy ground that's under water. I don't know if I've played in better conditions. Everything I brought with me is still wet and gross and I didn't take pictures for fear of ruining my camera, but the field conditions made the weekend even more entertaining. Amazing. A-mazing. Your Mom played so well. All those tournaments when we said we knew we could play better than we were, this is the playing we were talking about. I had so much fun playing with you guys. Wow. It was over far too quickly but I had a blast. And Chris, being there with you made this year's tournament that much better. My favorite part of the weekend was just sitting up late with you, drinking gin and tonics and telling stories. So recently I did a search on Drew University Ultimate Frisbee. Although it is not the team I'm currently on, it's the team that taught me to play so it holds a special place in my heart. I am fascinated with how it came to be and how it progressed over the years. So in my search, I was interested in finding past UPA rankings, a few past Callahan award nominations, and people who mention Drew University Frisbee. An ultimate team, like any other team, is all about the people who are on it and this team has been made up of all sorts of people along the way. It's like trying to look at all the little pieces and see how they've fit together over time to create the whole puzzle. There's one guy with a blog who travels the world. Another who is currently studying medicine. Even more who have either played on or against Drew Ultimate in the past. Each of these people were touched in some way and this one Frisbee team, mostly Bovine Intervention but also different names along the way, has been important enough for them in whatever they have on the internet. Then all these individual stories string together to form the story of a team. I like that. I just thought I'd share. "The fire looks like bacon." So I made it back from Cooperstown in one piece. It was a good weekend with lots of beer and ultimate. The title quote was from a random comment around the campfire while there. This past weekend, I went to “White Nights,” a tournament hosted by the Ommegang brewery where teams come from all over for the chance to win their weight in beer. I hadn’t been to the tournament before, but the website said there would be a Frisbee dog trick display and a band, so I was psyched. Six a’ clock rolled around and I bolted out of work to get on the road. Getting up past the NY Throughway was a breeze. I patted myself on the back for the wise decision of getting EZ Pass and hit relatively little traffic. By the time I got up to Cooperstown or thereabouts, I was following the directions and going down a dark road in the pouring rain, with no other cars in sight. If I was in a horror movie, that’s exactly the point where the car would break down. But it wasn’t and it didn’t, so my journey continued on toward the brewery. I turned into a parking lot that had a sign for visitor parking and looked around. They had a band set-up and had teams and tents and even a field with people playing Frisbee with a light up disc (since it was about 11pm by now). It was a pretty sweet set-up. The only problem was that I couldn’t find my team. I wandered around and looked, but no sign of them. So I called and tried to meet up. I was told to go by where the port-a-potties were, so I did, no team. After calling again, I was to meet at the band stand. Again, no luck. Then we tried to meet at the white barn building. No dice. It turns out I had stumbled on a Relay for Life event to raise money for cancer. The Fribee tourney was down the road. Oh, so they meant the other white barn, the other tents, the other band and the other Frisbee players. My bad. So after an hour, I went down the road and found the Ommegang brewery. The tournament was a lot of fun, even if we didn’t do as well as we could have. For instance, I apparently forgot how to catch the disc this weekend. It was a bit frustrating and tells me I need to be at more practices. We played some fun teams though. And the fields were some of the best I’ve played on; flat and soft and plush with newly painted lines to mark where the fields were. Camping was awesome with grilling and smores and the tourney had a pig roast and a bonfire. The band was a bit odd and did more drumming than songs, but a lot of people managed to groove to it quite well. And, since it was hosted by a brewery, the beer was fantastic. I didn’t get a chance to go on the tour, but I definitely brought home a case. I highly recommend this tournament to other ultimate players and commend the organizers for a well-hosted event. A lot of work went into it and it was a great time even if I didn’t manage to see the Frisbee dog tricks. Camping, ultimate and beer are an ideal combination. "Ultimate is like playing the piano. First you must learn to play by the rules, then you must forget the rules and play from your heart." Okay, I lied. It said love. But really, doesn't ultimate fit too? I mean, yeah, you always play by the rules, but in the beginning you learn a stack and strictly follow that then later you learn flow and how to use these tools in order to play the game. And play from the heart. Because you've been playing with those people for so long that you know how they play and you're connected on a level beyond the rules and beyond your game strategy. That's what it's all about (like the hokey pokey). See when I read it, I didn't think that really was true about love at all. What rules? But when I saw this, I thought of ultimate and of a practice I tried to run long ago. It was along the same lines. Oh, and while we're on the subject, if you haven't visited the website for The Legend of Crazy George, you really should. It's awesome. My first frisbee post. Ultimate frisbee is an interesting sport because it is in its infancy in comparison to many other sports. However, early in its history, it has grown in popularity very quickly and has reached a crossroads. Ultimate has formed its own community, being relatively unknown and based on principles of good faith and sportsmanship. While competitive, it is played with a respect of all other players, no refs and no intentional fouling. These must be assumed to be true in every instance or else the rules would fall apart, and sometimes do. See, it's not spirit instead of competition. The spirit award should never be a consolation prize. It's just that spirit should never be sacraficed in order to be competitive. The best is when you have both. But this post is not intended to explain ultimate or SOTG. There are plenty of sites that do that and when I get the chance, I'll point you to some. I want to talk about something far more intriguing; namely the future of this sport. I did a linguistics project on ultimate and I found that due to the grass roots nature of the sport, the terms and knowledge of the sport set its players apart, creating a community. Knowing how to play and how to be in the "cup" is a passport to the hundreds of pick-up games going on around the world. However, as the sport becomes more popular, this community may be lost. When enough people start playing, the level of sportsmanship falls due to human nature. You can no longer guarantee that the person who is joining your game is immediately a person who holds the same spirited values as you do, as you once could have. It will be interesting to see how the sport evolves. The community is very active and has differing views on the future of ultimate. However, we all care about the sport and want to play it until we can't play anymore. I found this online the other day. it's an article about my old team and it made me smile. "Later in college, where Ultimate was my third major, we played teams like Drew University (they worshiped a cow skull and had lots of "bovinity" rites) that were rarely winners in the score, but acted like winners on the field, always having a lot of fun and putting forth great effort - and sometimes they "won the party" too. 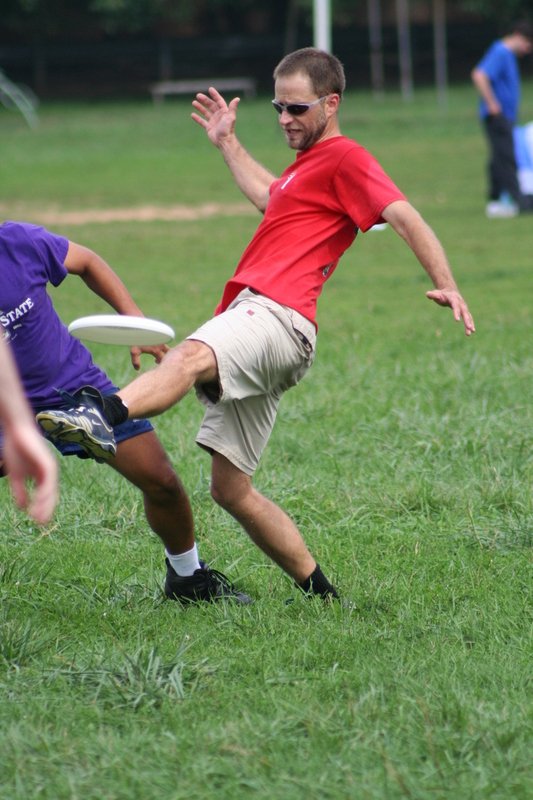 Drew was known for having the "Spirit of the Game" - something emphasized a lot in Ultimate - what other sports call good sportsmanship (to the point of applauding the other team for good plays, offering suggestions to newer players on technique, etc.). In a game with no referees, the "Spirit of the Game" is what distinguishes Ultimate from many other competitive sports. "I bring this up not for nostalgic reasons, but to make a larger point. Despite my experiences, even I sometimes forget how necessary fun is in working successfully towards a common goal, whether you win or lose. It does matter how you play the game." Anyway, I've met some amazing people playing ultimate and I'll keep playing as long as I can find a line of people who play the sport the way I feel it should be played. So far so good.